Fridays at the office start with bagels and donuts, provided by the company. Next, we had a team lunch at a local Chinese restaurant to enjoy the company of a writer in town from Cebu for training. And then, not even two hours after we finished lunch, it was time for Treats-A-Palooza! 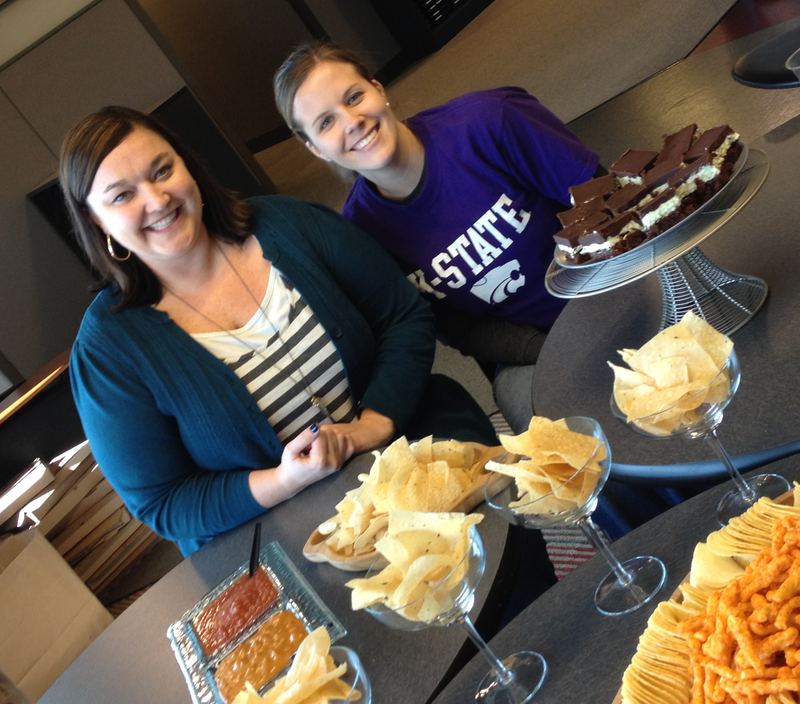 Treats-A-Palooza is our team’s monthly birthday celebration, and our celebrations include – you guessed it – FOOD! Annie and I were in charge of bringing treats for the two birthday girls. One likes rich, sweet desserts with combinations of flavors; the other prefers salty goodness. With a little investigation and planning, Annie and I decided on a “tacky tray of chips” for Christy that included vinegar and salt Pringles, chips and salsa, and jalapeno cheddar Cheetos, and a plate of Chocolate Mint Brownies for Stacy. Click for recipe. Now I know it sounds like a weird combination, and it tasted much better than it sounds. Salty chips and sweet brownies; spicy snacks and cool mint. Somehow it worked! I wasn’t so sure about the idea of mint brownies, but one taste convinced me they were a great idea! 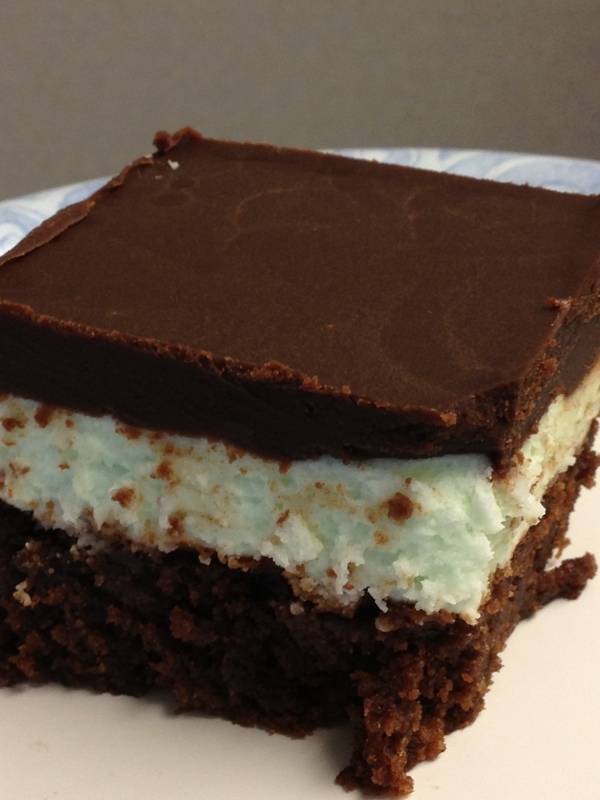 The layers complement each other nicely – chewy brownie, fluffy mint cream, and a smooth, buttery ganache topping that I could have eaten all by itself. I made tweaks to the original recipe based on pan size used. The original recipe called for a 9” square pan but used a brownie mix for a 9 x 13” pan. I used the same size brownie mix but baked them in the 9 x 13” pan. But in doing so, I had to double the filling and topping to make sure there was adequate coverage. You can use the 9” square pan if you want a smaller batch, and if you do so, make sure to use the smaller brownie mix and halve the filling and topping ingredients. People have mixed reactions about the combination of mint and chocolate, so my advice is to not overdo the mint! It’s such a strong flavor that if you add too much extract, the mint will overpower the flavor of the dessert. Start with the smaller amount of extract and taste the filling. If it’s not strong enough, add more in 1/8 teaspoon increments. I think I used about 1/2 teaspoon extract for the 9 x 13″ pan, and I think it was just right. Make sure to plan ahead and leave yourself enough time to make these – each layer needs to cool before the next is added. I made the brownies a day ahead, then added the filling and topping the next evening. If you’re not serving them immediately, store them in the frig. Take them out about an hour before you want to serve them, and cut them while they’re really cold for straight lines. It takes lots of food to keep an RFP Team going! Here’s a picture of my team enjoying our treats at the end of another crazy week. Finding time for so many of us to sit and chat at the same time is rare – even in this picture we’re missing 5 people for various reasons. 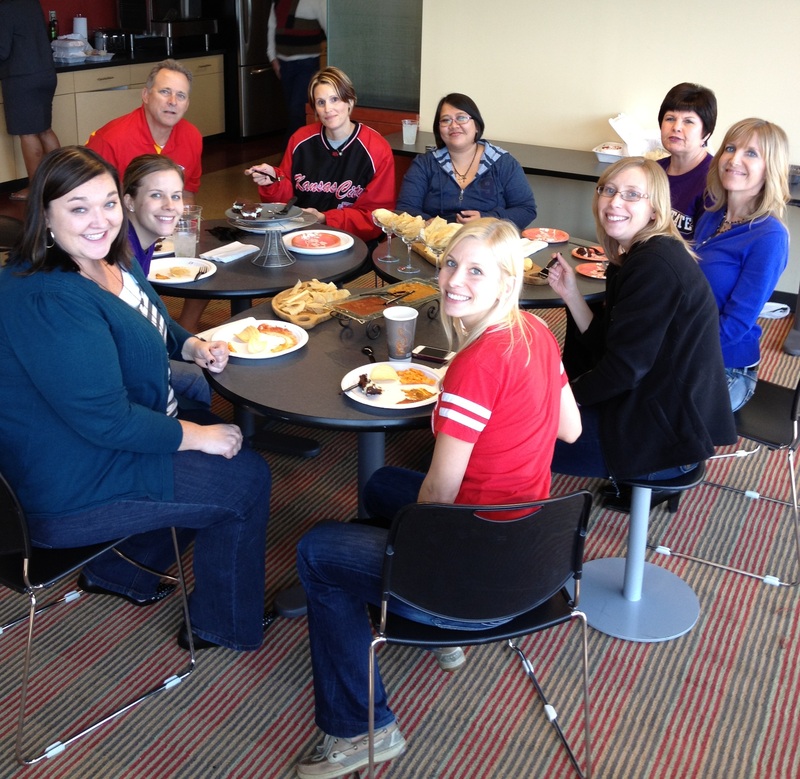 Team lunches and treats afternoons are fun for the food, but even more fun because of the conversations! I’ve learned over the years that having great co-workers is one of the best parts of a job, and this group is no exception. Who wouldn’t want to work with smart, funny, hard-working people?! Serve these delish brownies to your co-workers at your next Treats-A-Palooza or take them to a holiday party. Once you taste them you’ll want more. In fact, I might have one for breakfast tomorrow – if the rest of my group doesn’t get to them first! One of my favorite desserts to date! A perfect harmony of mint and chocolate! Many other flavors could be used in place of mint, ie. orange, raspberry, peanut butter!! Delish! Thank you for the bday treats MJ! I loved them too! I would never have tried those if you hadn’t asked for mint and chocolate. I like the idea of using different flavors and think I’ll have to try a couple of those!